Escape the rush of the city and experience a retreat in the peaceful setting of rural Benalla. Benson House is a spacious home suitable for families or up to six guests. Children are welcome and pets are too upon request. Benson Lodge is a clean, detached unit perfectly suited for that relaxing getaway or motel alternative for your journey break. Benson House is a double brick Art Deco home with three large bedrooms, two queen and two king single beds, fully equipped kitchen and 1.5 bathrooms. Benson House is ideal for family groups, with the property being about space. The generously sized lounge features a comfy lounge suite, television, mini hi-fi, free Wi-Fi and dining table and chairs. Alternatively, enjoy chatting around the table in the separate dining room, or outside under the magnificent palm tree, or in the glassed sun room area. Benson Lodge offers you all the amenities that will ensure that your stay is perfect. Sleeps two people. Benson Lodge has a queen bed, separate bathroom with shower, basin and toilet. Enjoy refrigerated cooling and heating. There is a small table and chairs, a television, pod coffee machine and bar fridge. Light continental breakfast supplies are provided, however, award winning cafes and bakeries are only a pleasant short walk away for your convenience. A microwave is available. Benson Lodge has a spacious, secure backyard to relax in, has barbecue facilities and an outdoor entertaining area for you to enjoy and has a lock up garage to secure items such as bikes. 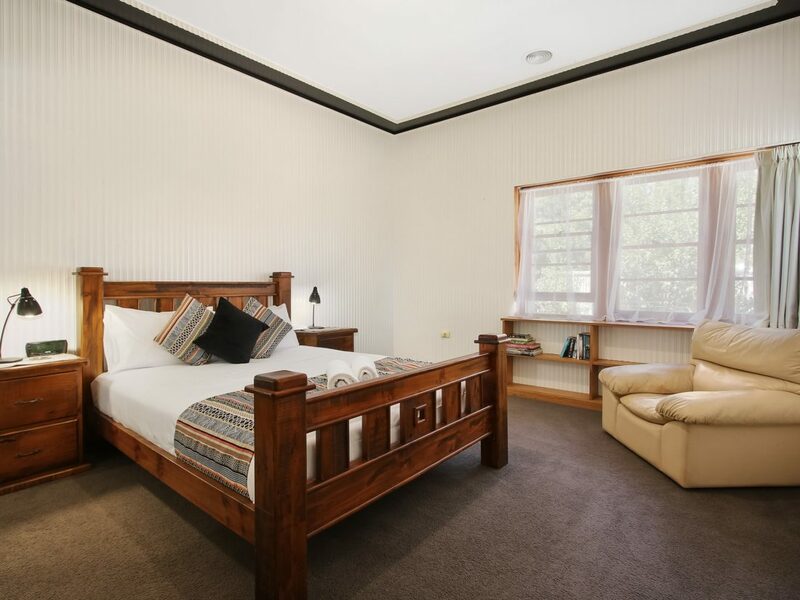 Benson Lodge is pet friendly and is close to all Benalla amenities including laundromats. Benson House features spacious bedrooms with comfy beds and quality linen and a huge lounge to unwind in. All very clean with everything you need to have a relaxing break. Comfortably sleeps up to six. Light continental breakfast supplies are provided. Award winning cafes are only a pleasant short walk away. Alternatively, guests have full use of the well equipped kitchen. Prepare a coffee with the pod coffee machine. The large bathroom has a bath, separate shower, basin and toilet. There is also an additional indoor toilet. Benson House is pet friendly, please discuss prior with owners. Benson House is perfect for groups and families. Your Benson House booking secures your sole use of the house.